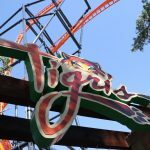 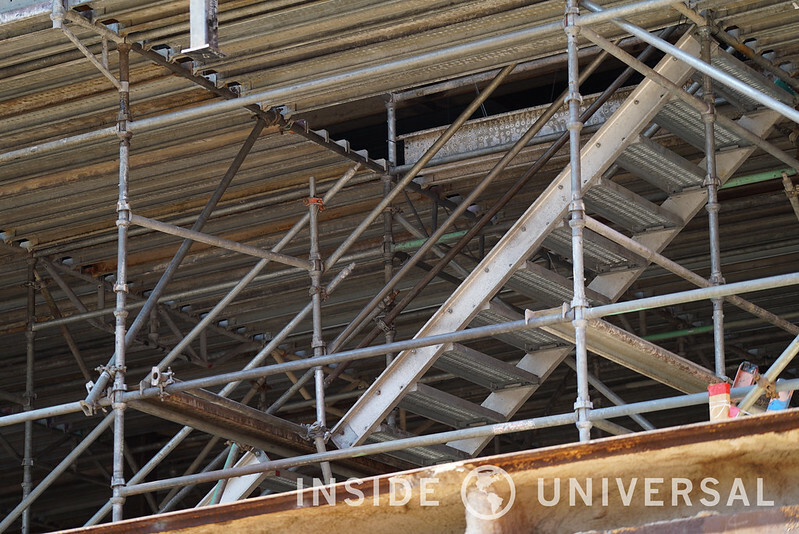 Welcome back to another photo update! 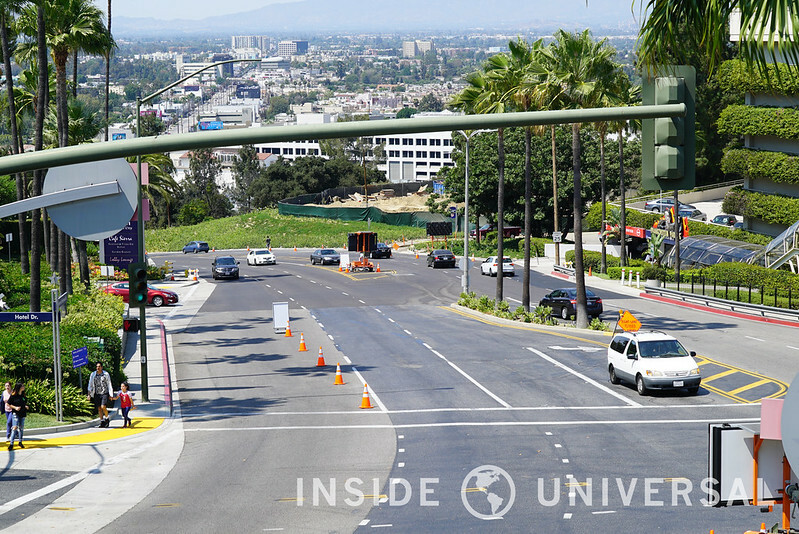 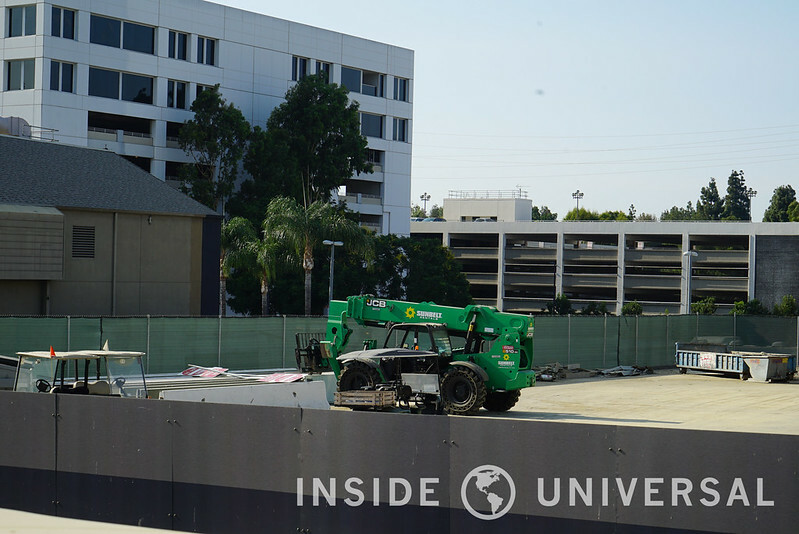 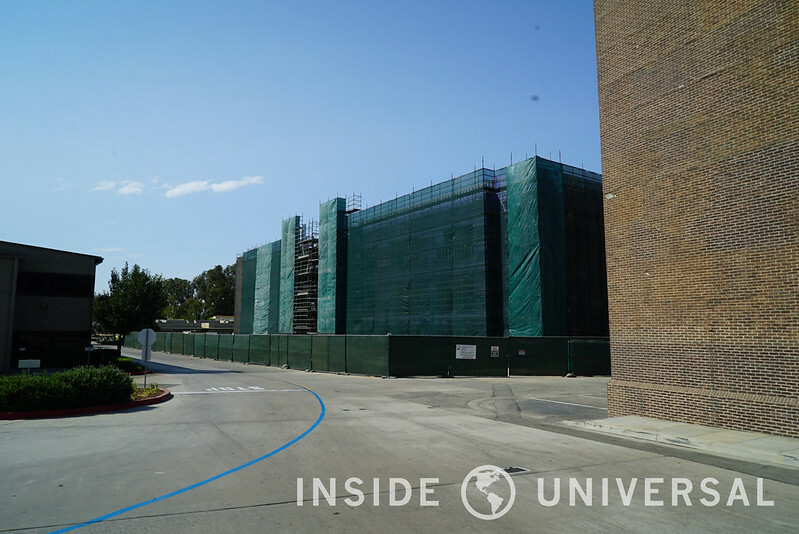 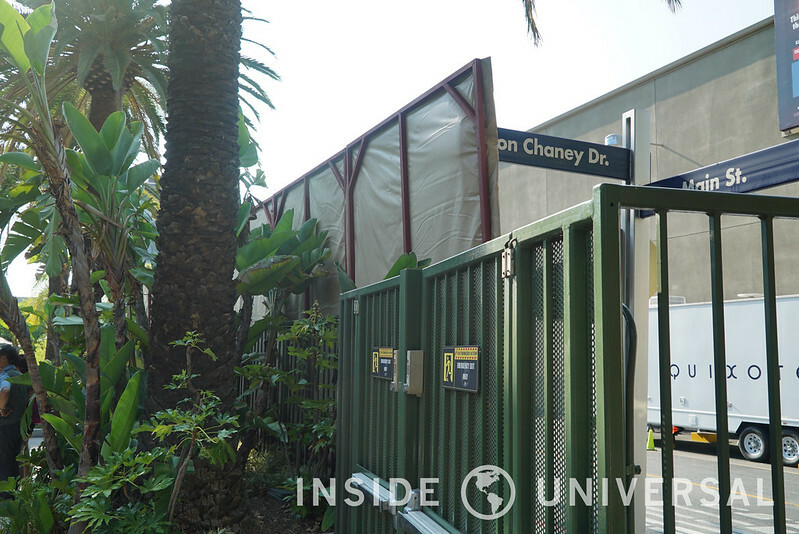 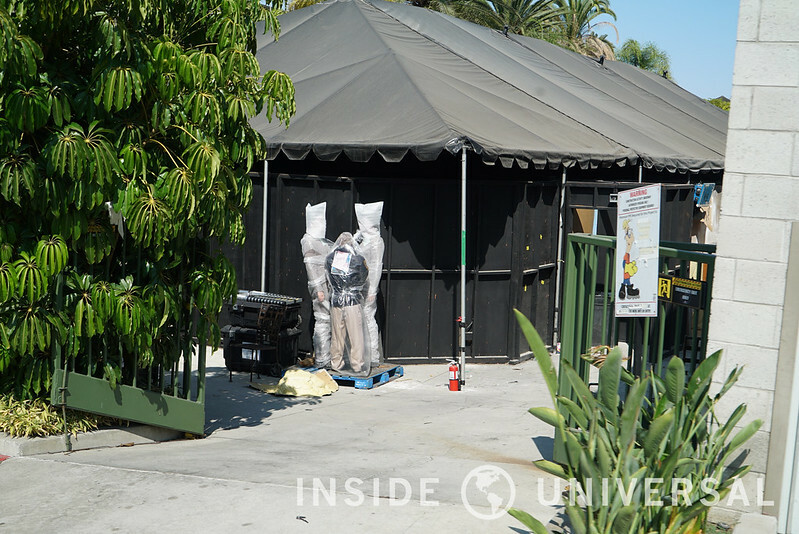 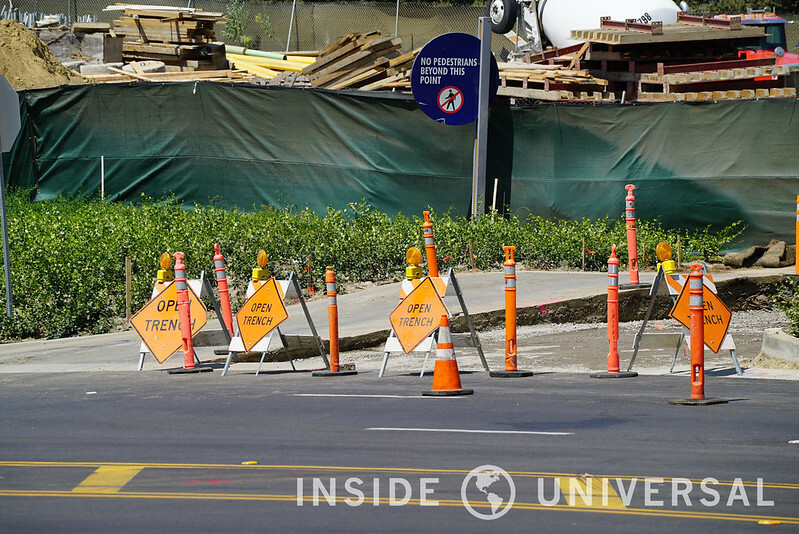 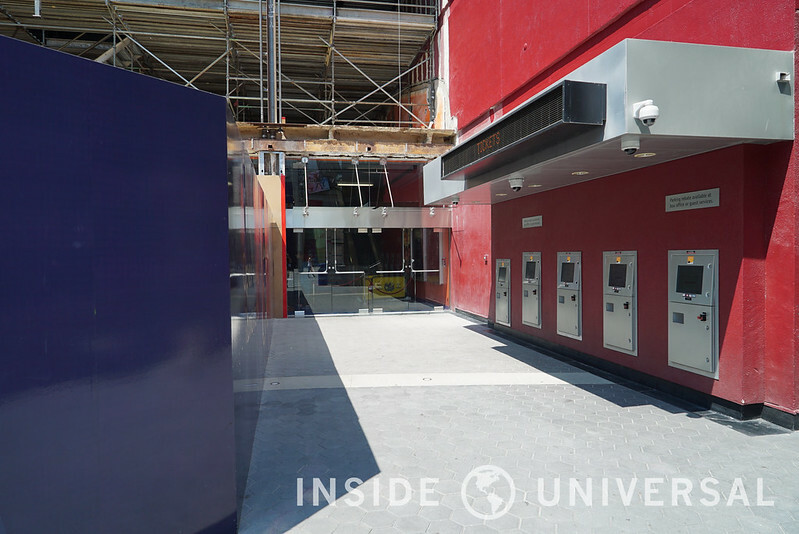 This week, we’re going to cover the continuing construction at Universal’s Lankershim entrance, new details on this year’s Halloween Horror Nights event, the ongoing rejuvenation of CityWalk Hollywood and more. 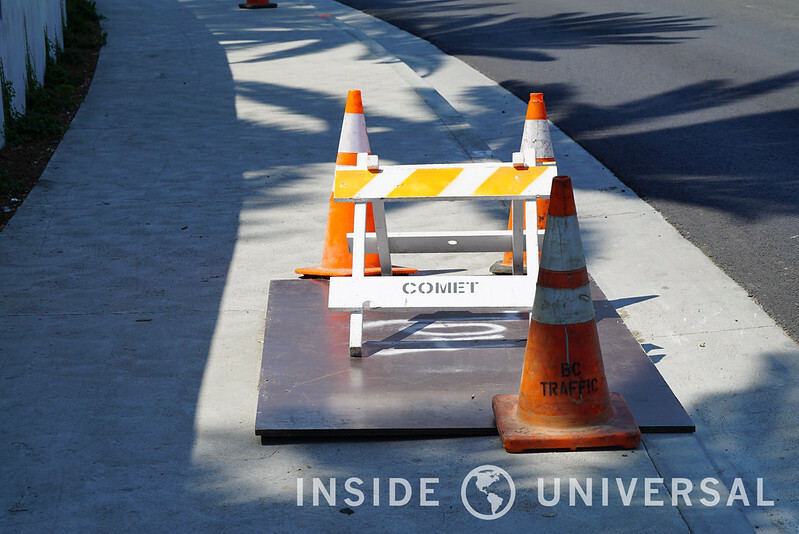 We’ve got a lot to cover, so let’s get right to it! 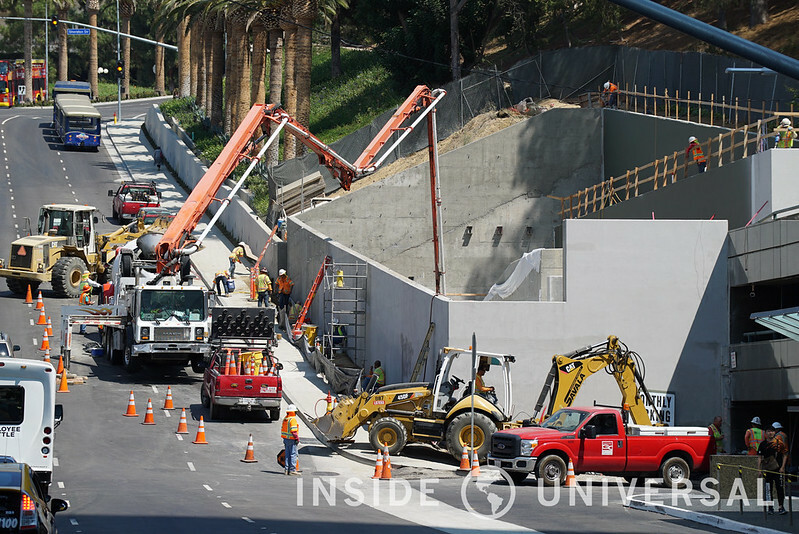 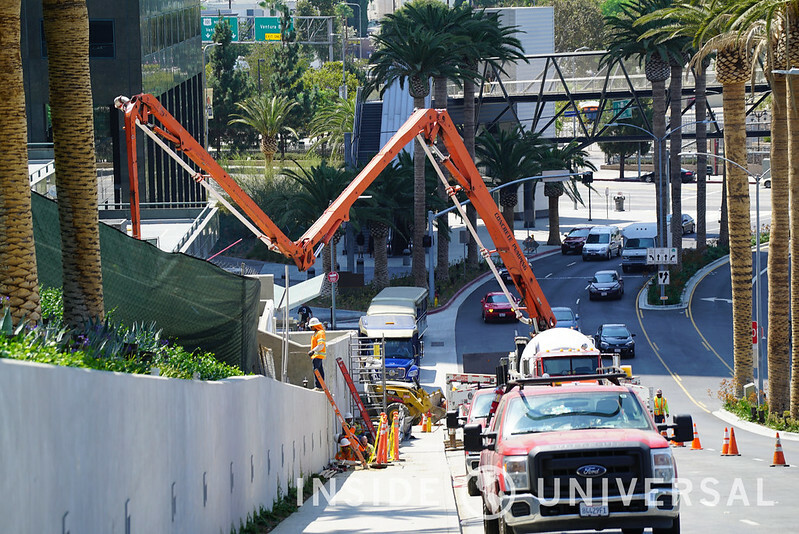 Crews are progressing on the tunnel connecting 10 Universal City Plaza to the studio with heavy machinery continuing to dig away at the huge mounds of dirt that were once nestled underground. 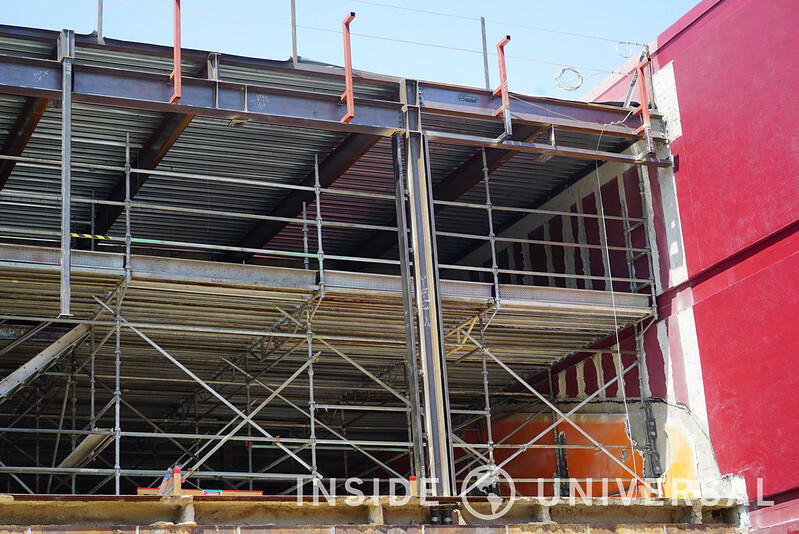 Concrete has been poured over much of the reinforcing bars to create a frame that will encompass the stairway that will lead employees into the tunnel. 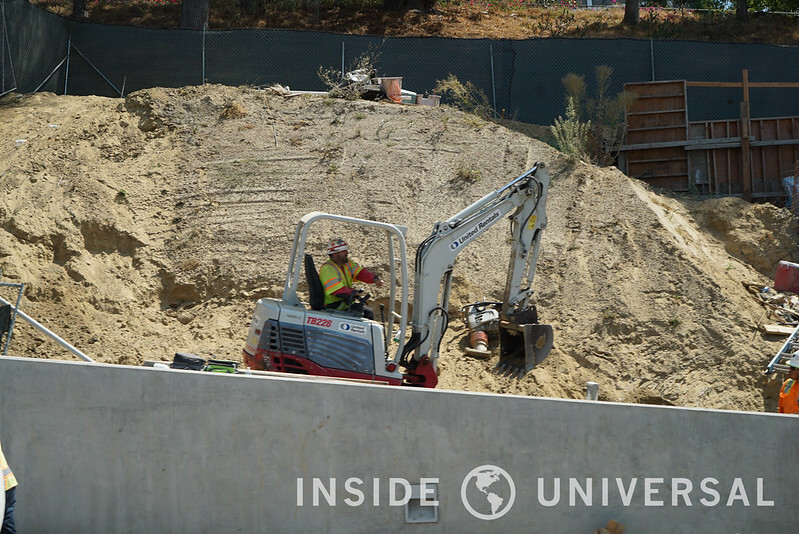 Meanwhile at the old site of the Fung Lum restaurant, much of the dirt that once occupied the space has been moved to an unknown location. 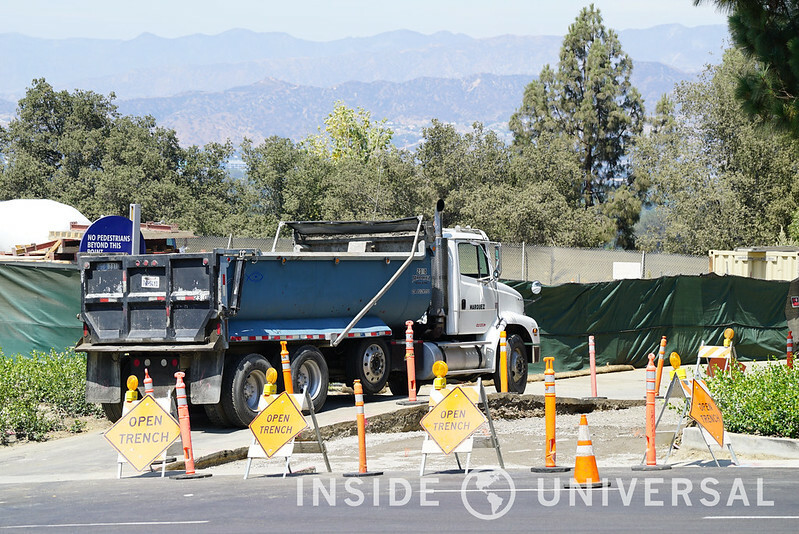 It seems crews have been using the site to offload superfluous dirt until it can be used or disposed of. 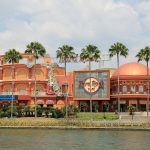 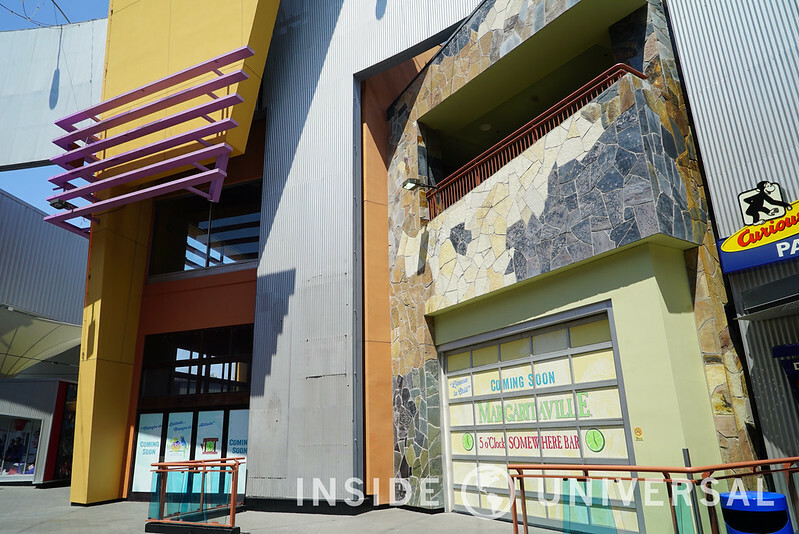 Over at CityWalk, work is still being done to revitalize the shopping and dining district with a slightly more trendy dining experience. 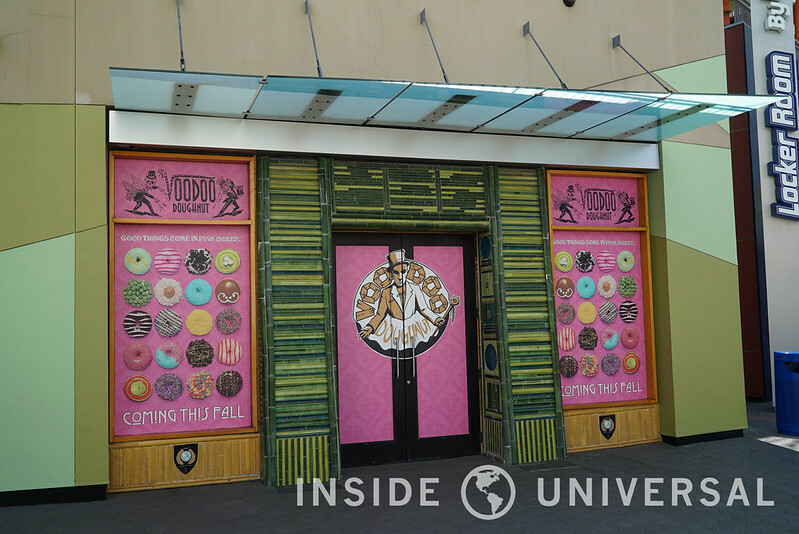 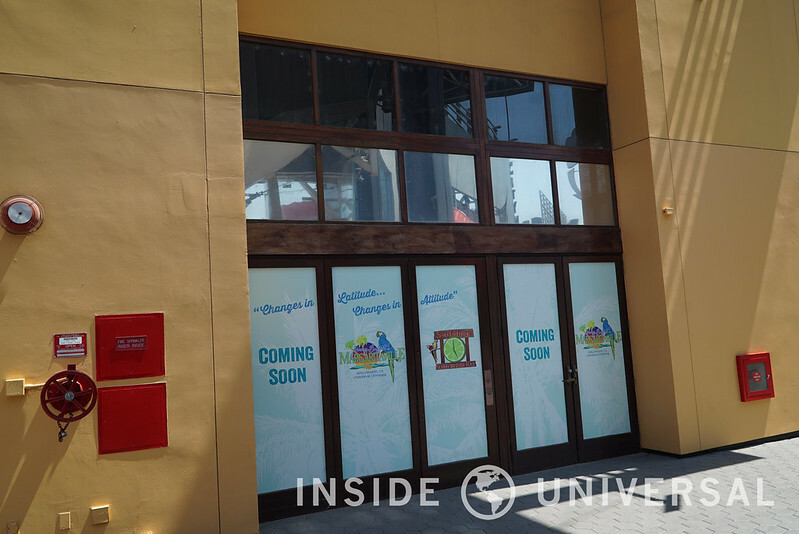 Margaritaville and Voodoo Doughnut have continued to show minimal signs external progress, so it appears most of the work is being completed away from public eyes. 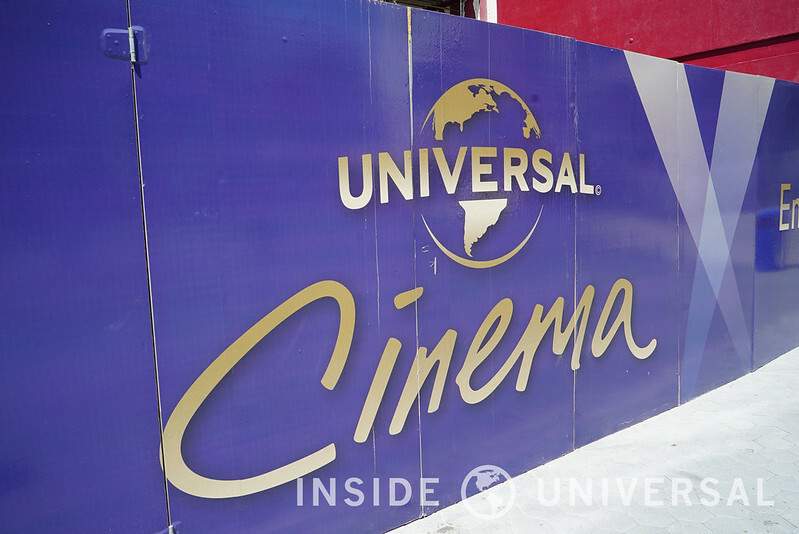 On the other end of the spectrum, Universal Cinema’s construction is very visible. 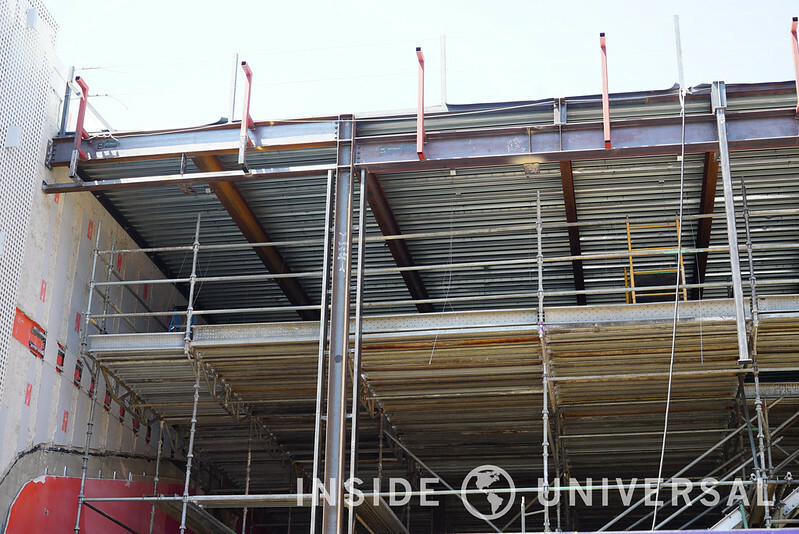 Sections of metal and concrete have been added that frame the shape of the new structure. 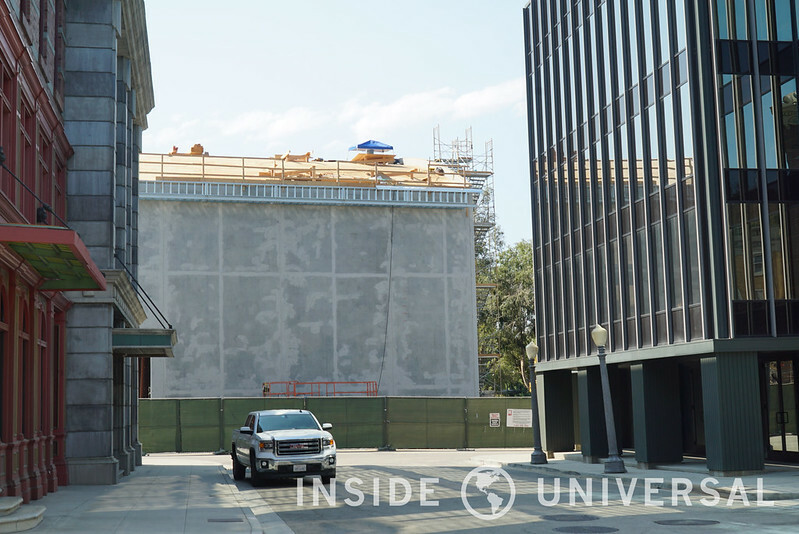 The remodel will also include new seating, laser projectors, and brand new perforated screens to allow for 360 degree audio in every theater. 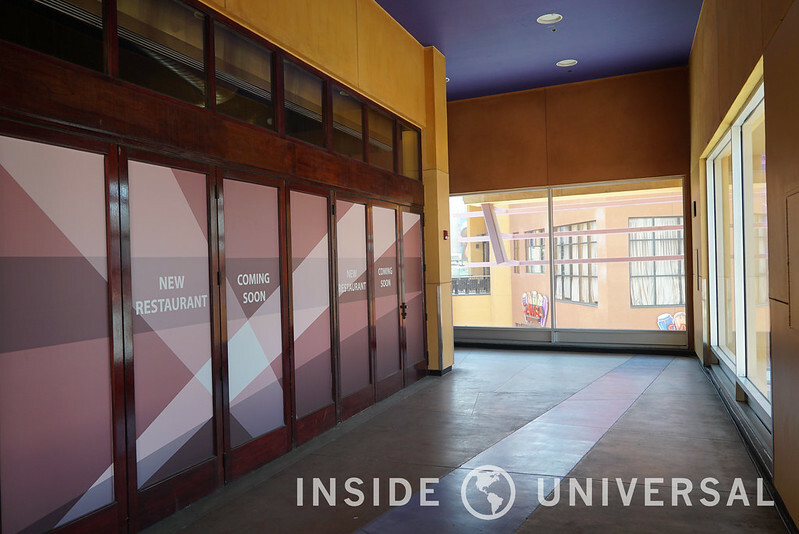 Guests can also expect a new bar/lounge on the top floor of the theater for those times when you show up a little early to your film. 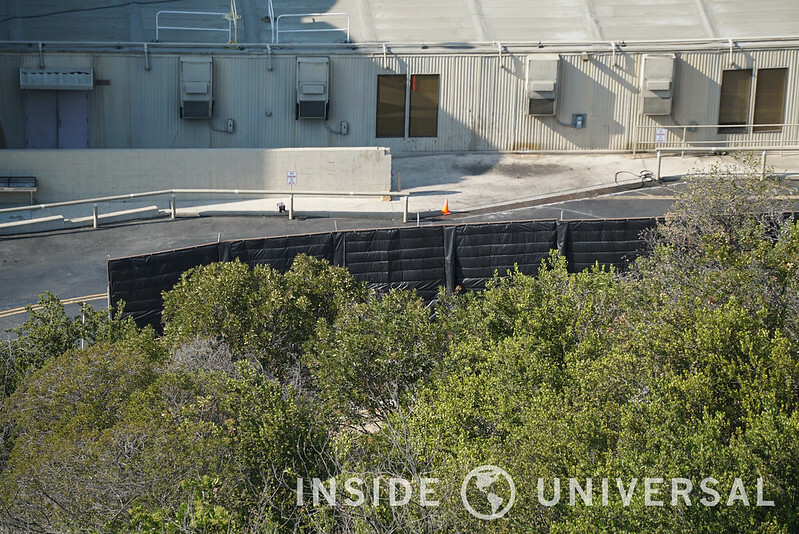 With Halloween Horror Nights inching closer and closer, crews are working tirelessly to finish up the houses in time for the event’s September 16 opening. 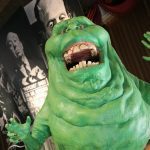 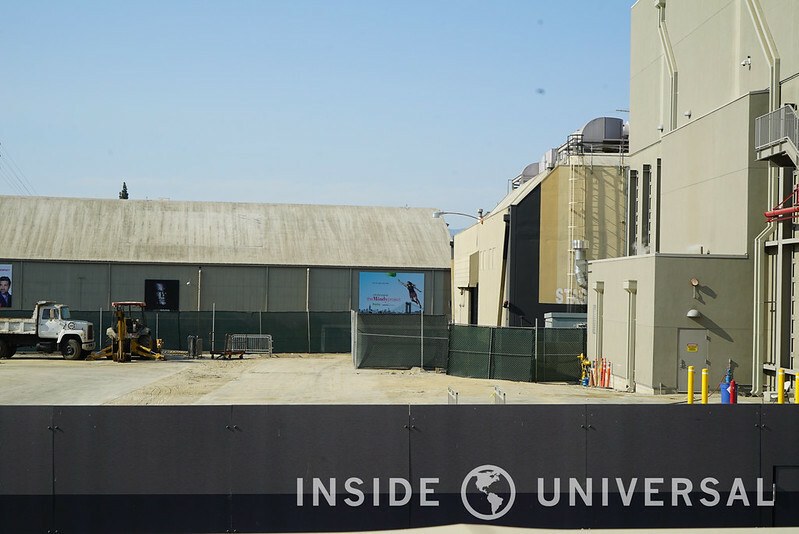 At last, we know the theme for each and every maze now that Universal has announced this year’s complete roster, and indeed, it is a horror buff’s dream with Halloween, The Exorcist, American Horror Story, Texas Chainsaw Massacre, Krampus, and Freddy vs. Jason. 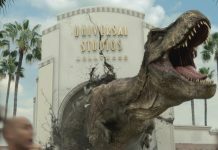 We’ll kick it off with Halloween: Hell comes to Haddonfield, which will take place in the Jurassic Park extended queue. 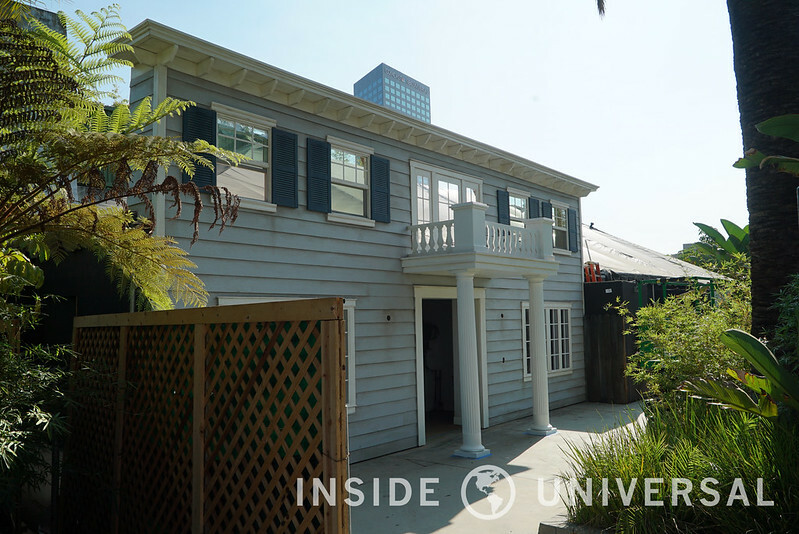 The facade is being finalized as the Doyle House – the location where Michael Myers was shot by Doctor Loomis in the very first Halloween film. 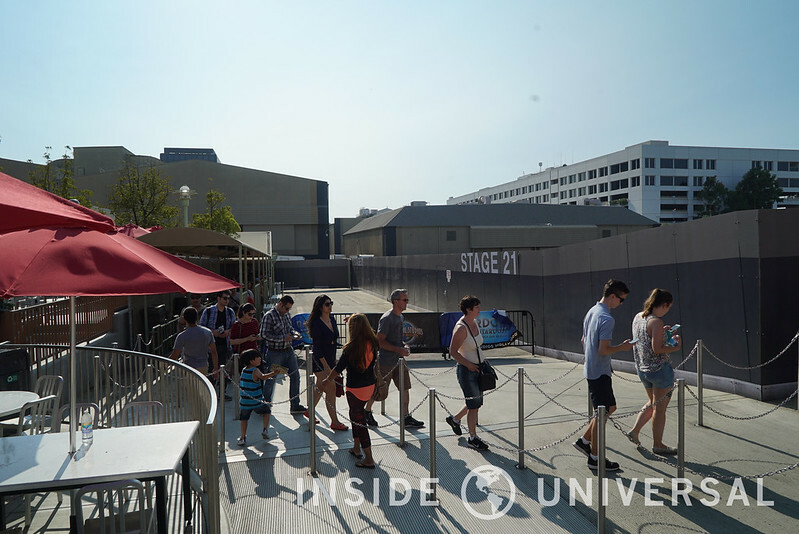 For the first time ever, this maze will be a sequel starting directly after the events of the Halloween maze at last year’s event. 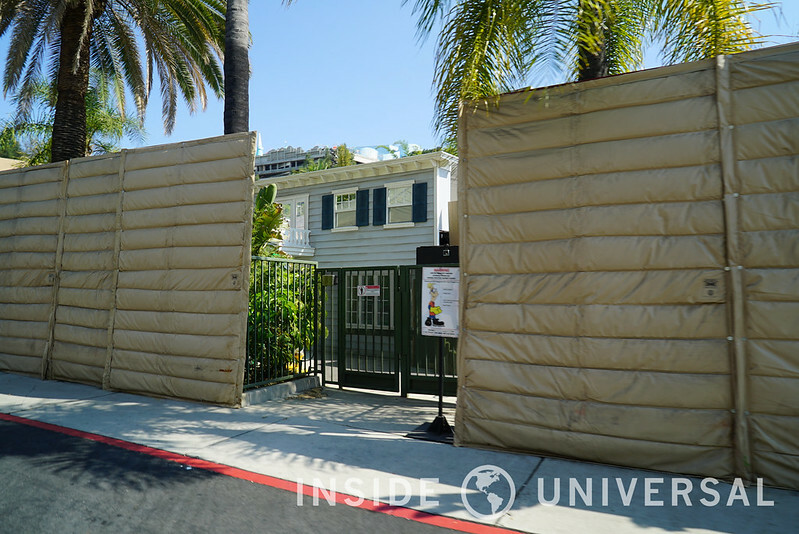 Sound proofing barriers have been hung deter prying eyes as well as to keep noise to a minimum during the event. 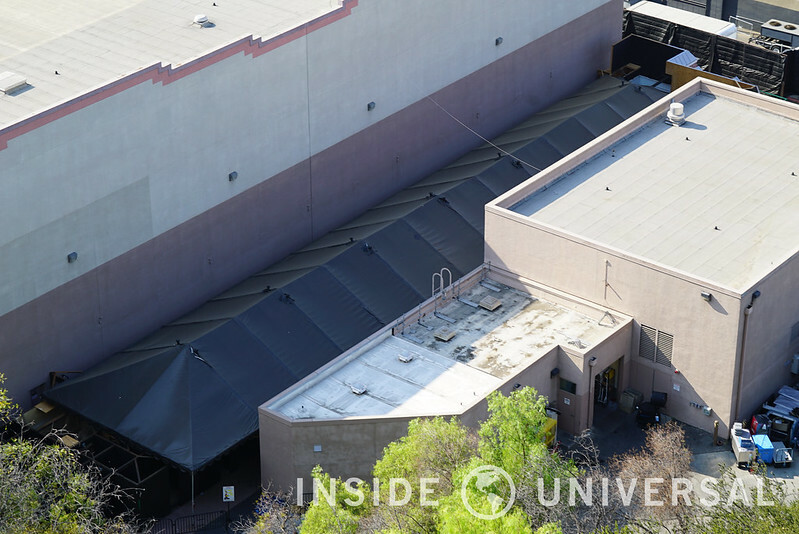 Down on the Metropolitan sets, the facades are beginning to show quite a bit of theming. 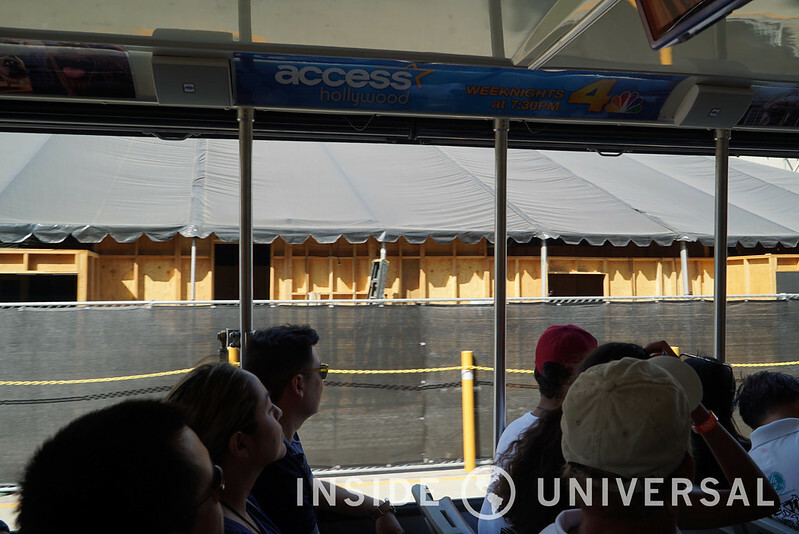 We now know that American Horror Story will reside in the location of last years tram pick up, right behind the painted facades that face New York Street. 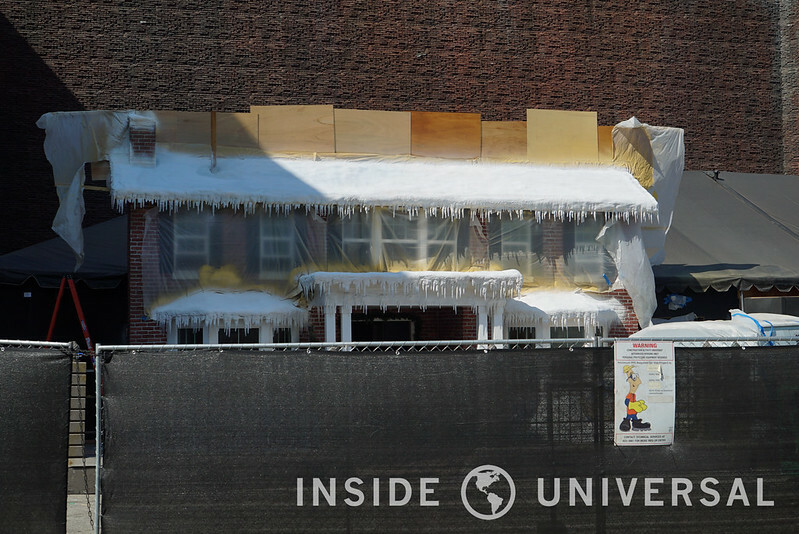 Krampus, meanwhile, features a frosty facade of the Engel family home with icicles and all. 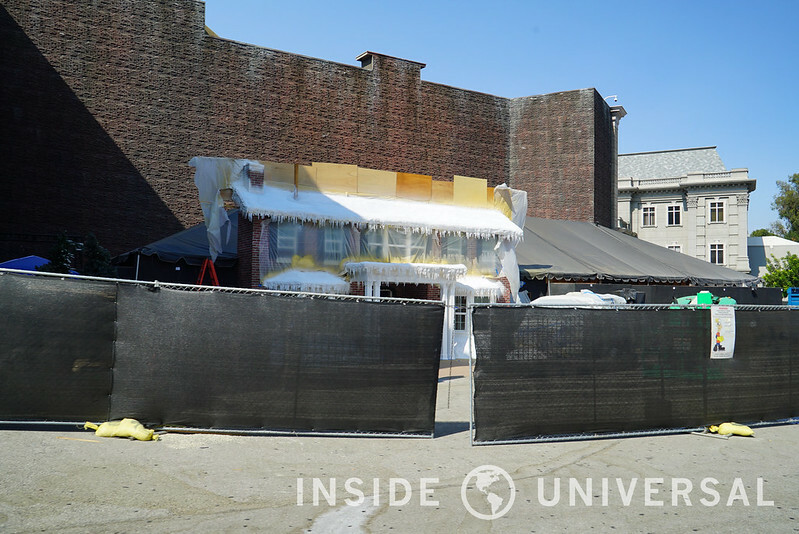 The maze will take guests through many of the most beloved scenes from the movie including the frozen mailman and the murderous gingerbread men. 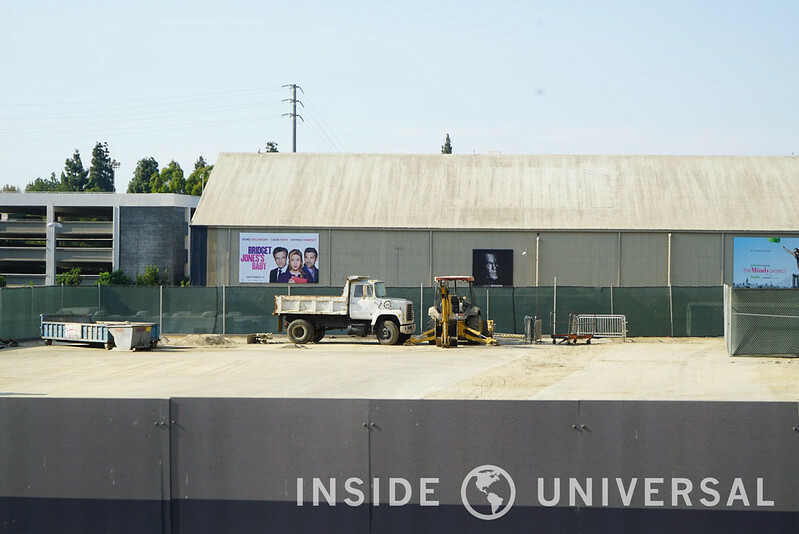 Freddy vs. Jason will take place in an industrial plant – complete with a nod to the late great creator of Freddy Krueger, Wes Craven. 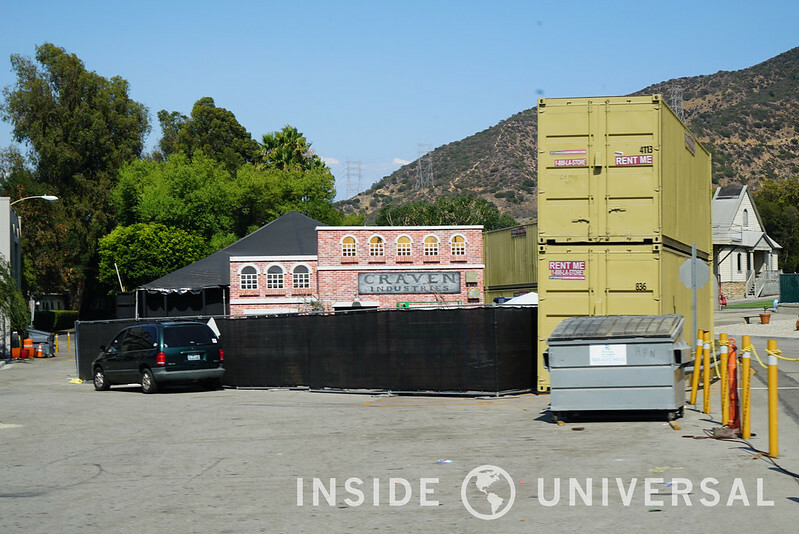 This year’s maze will feature a variety of endings, and guests will be able to experience Freddy or Jason being victorious depending on when they walk through the maze. 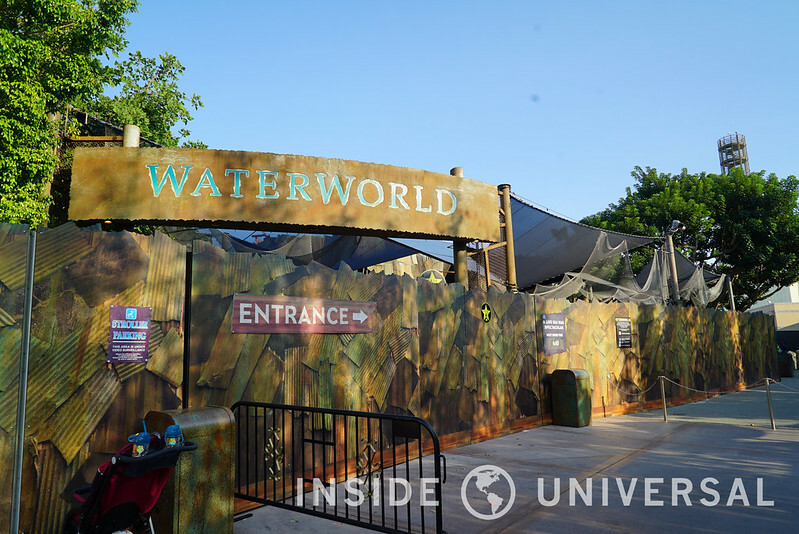 This maze simply requires multiple walkthroughs! 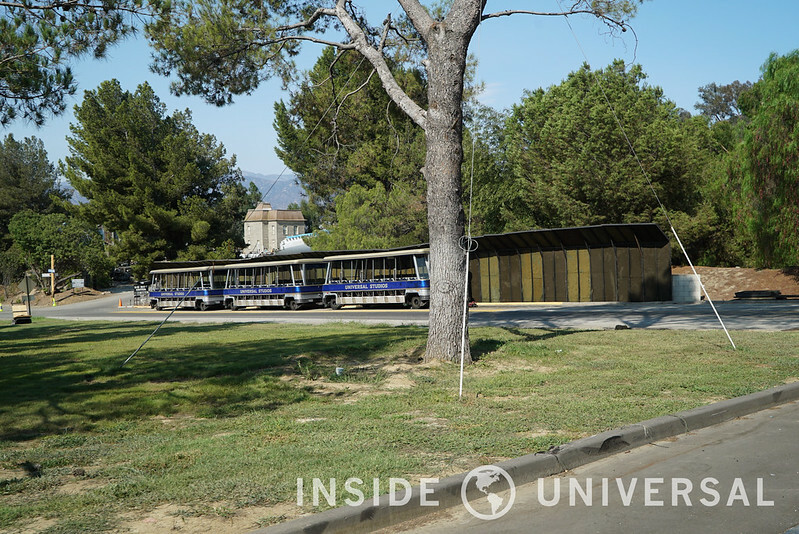 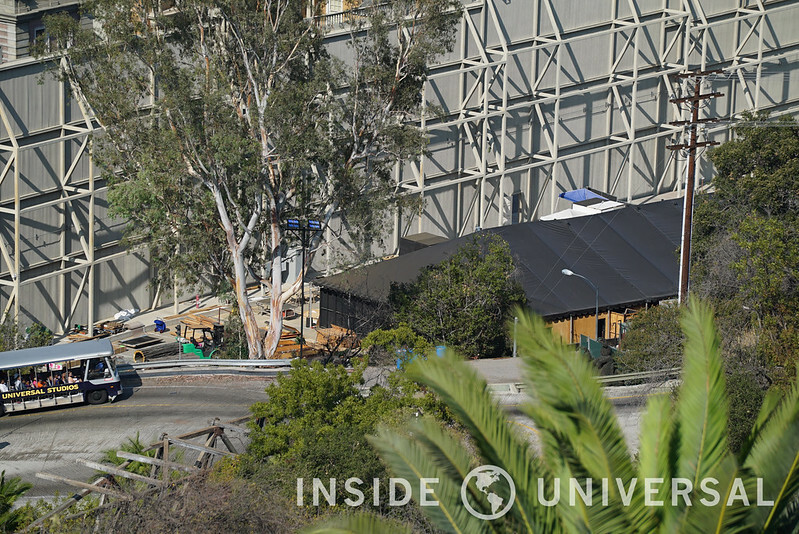 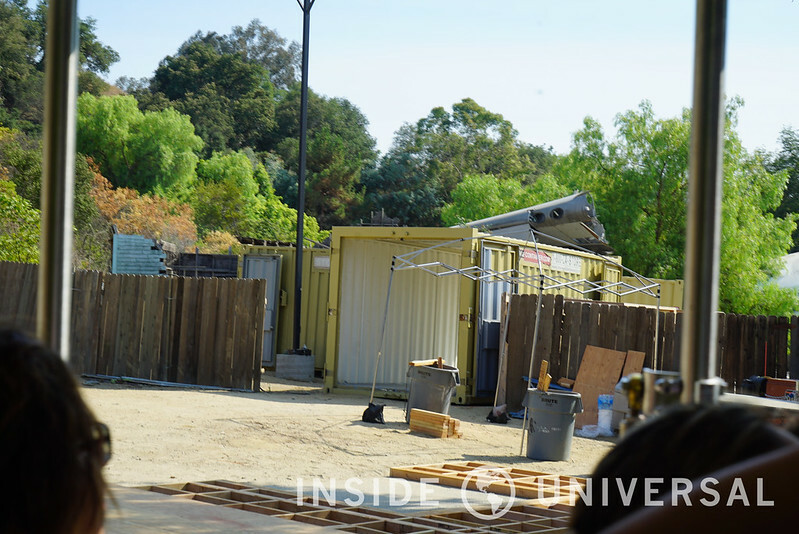 Finally, work on the Terror Tram is now becoming apparent with storage containers being placed at the plane wreckage from War of the Worlds in order to corral guests. 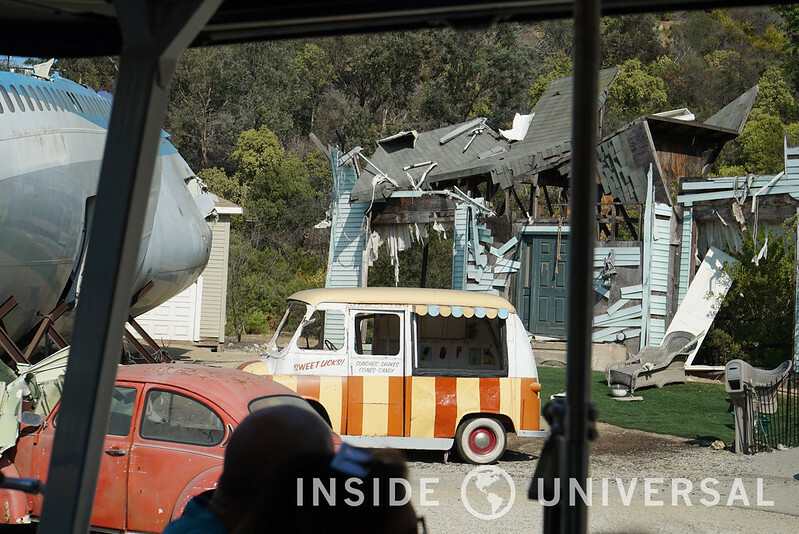 The ice cream truck from Clowns 3D has also been placed close to the outskirts of the wreckage. 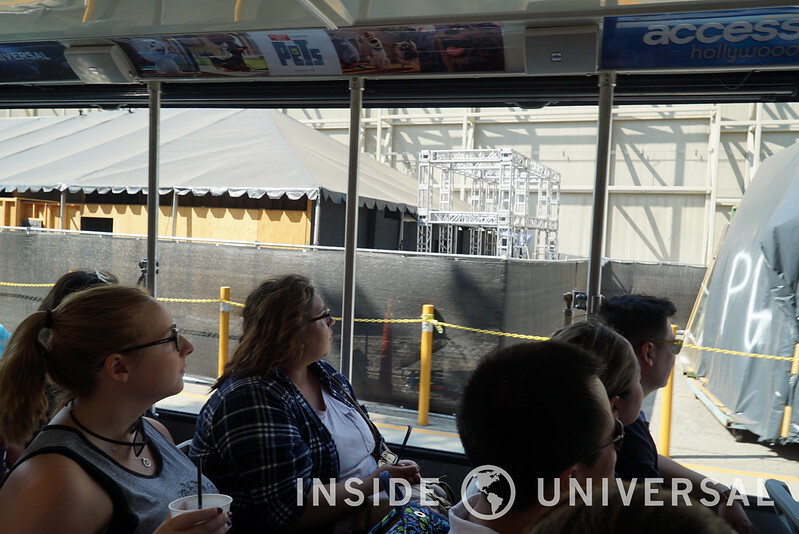 The Terror Tram will be an original idea this year that will appear to be circus themed, so stay tuned to Inside Universal for the full details in the coming days! 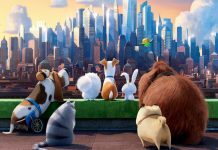 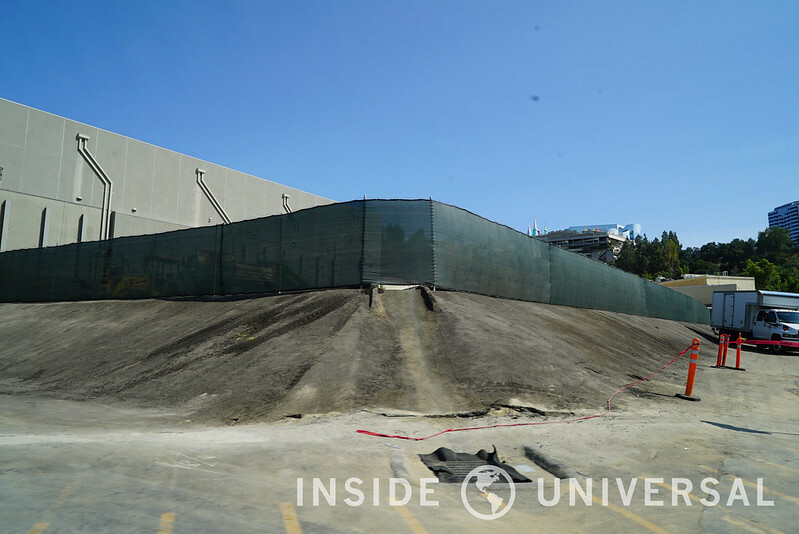 It appears that the huge dirt mounds and some of the heavy machinery from our last update have disappeared as work on the new Secret Life of Pets attraction slowly moves forward. 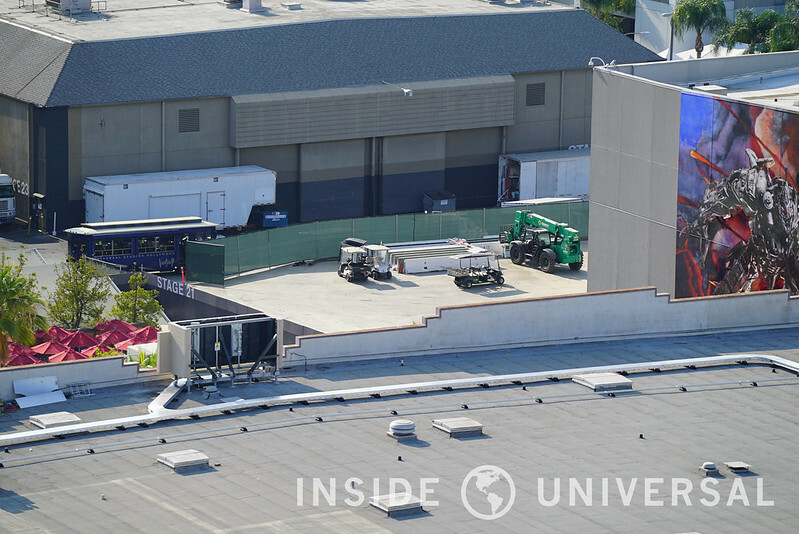 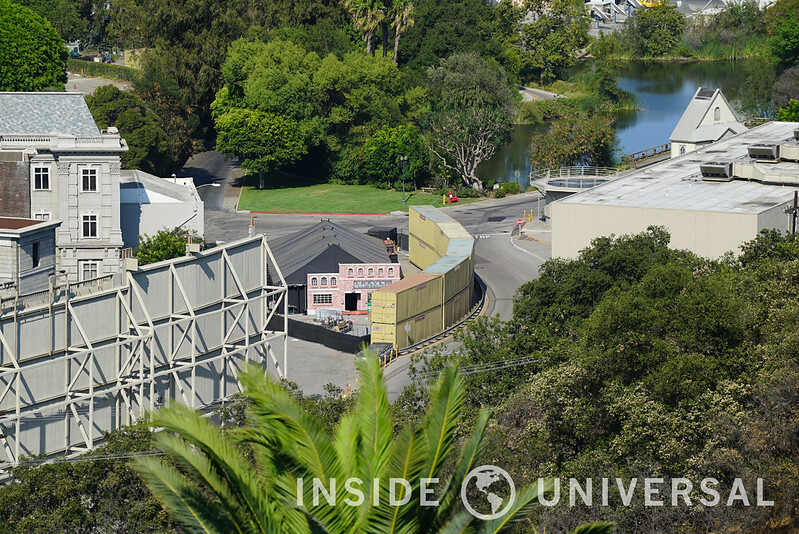 Universal’s 5 year plan keeps on trucking with construction advancing on the brand new soundstage located adjacent to the Metropolitan sets. 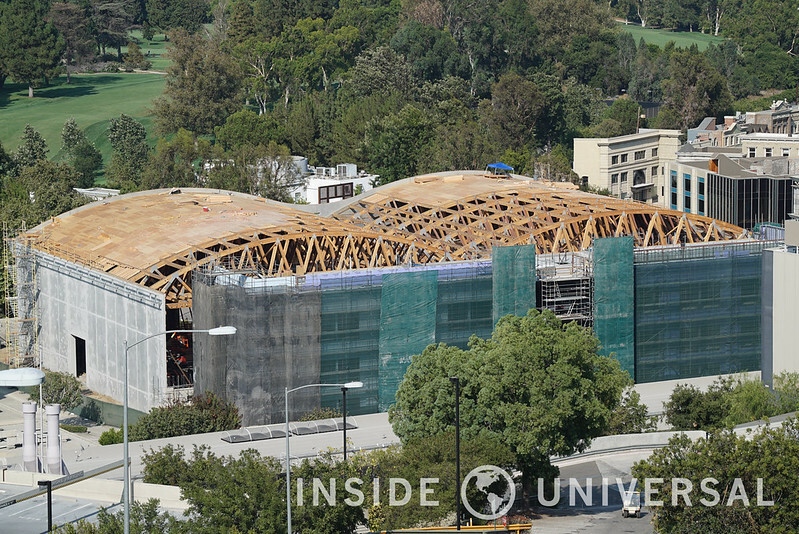 New roofing is being installed by crews and green netting is being used to cover the construction. 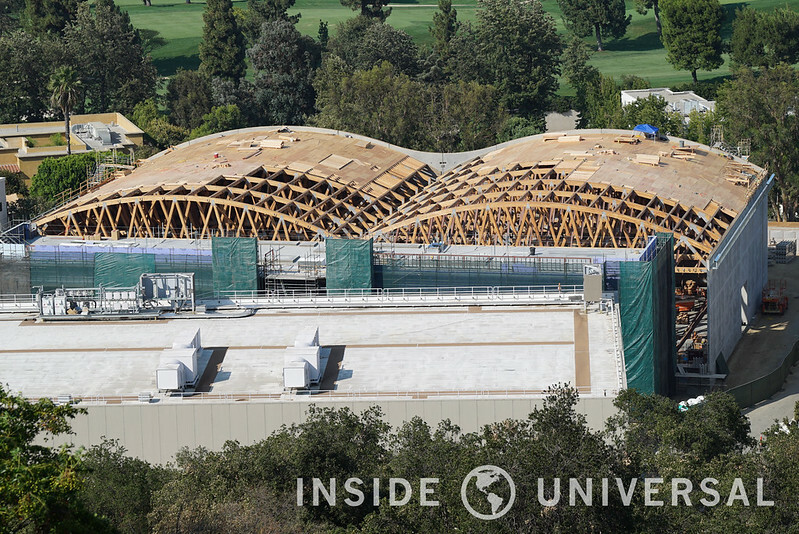 That does it for this week’s photo update. 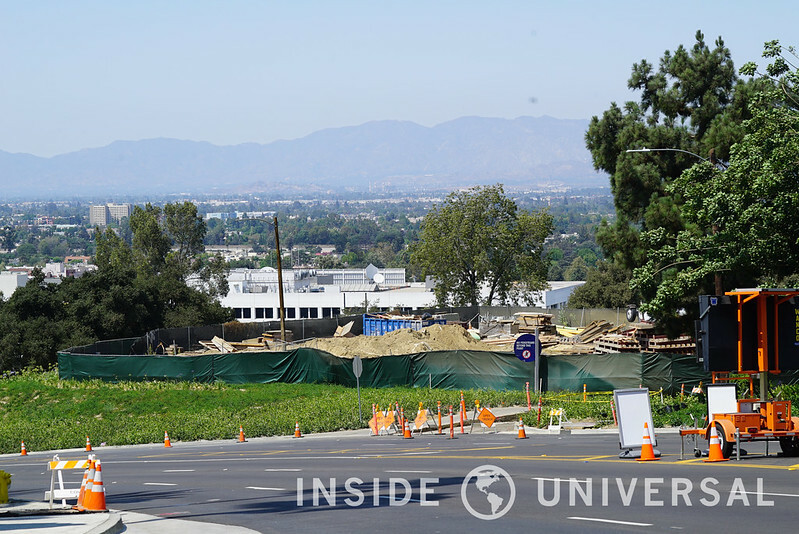 It seems like everyday there are new Halloween developments and it’s super exciting to see the park change and grow. 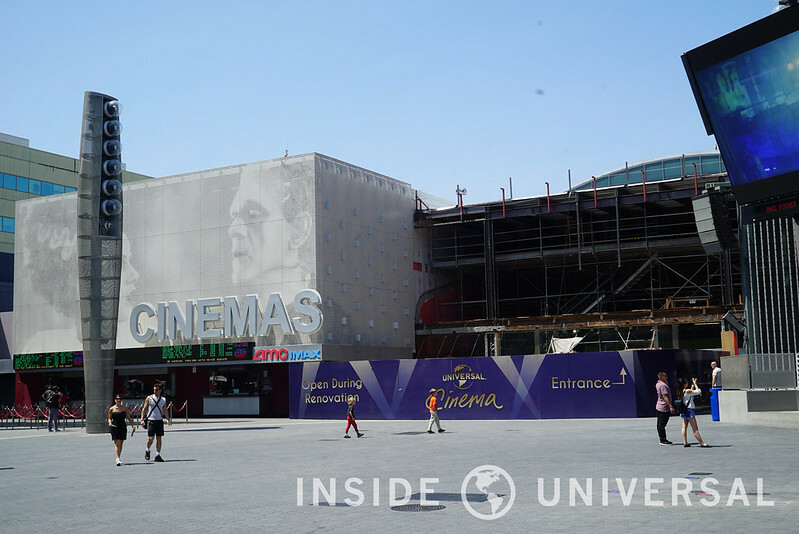 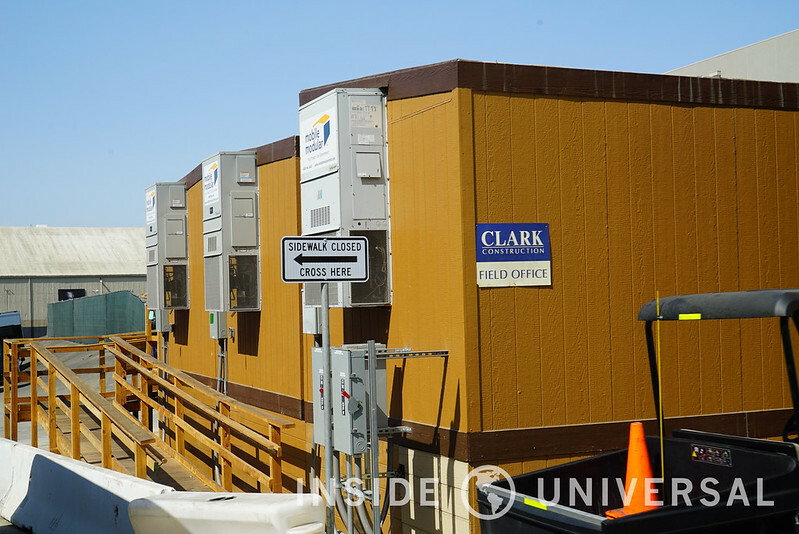 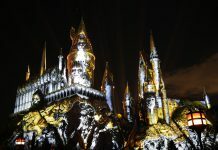 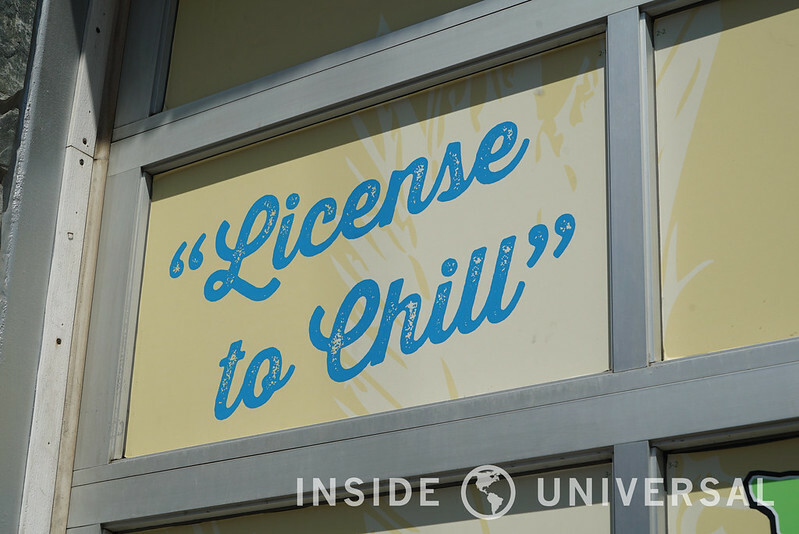 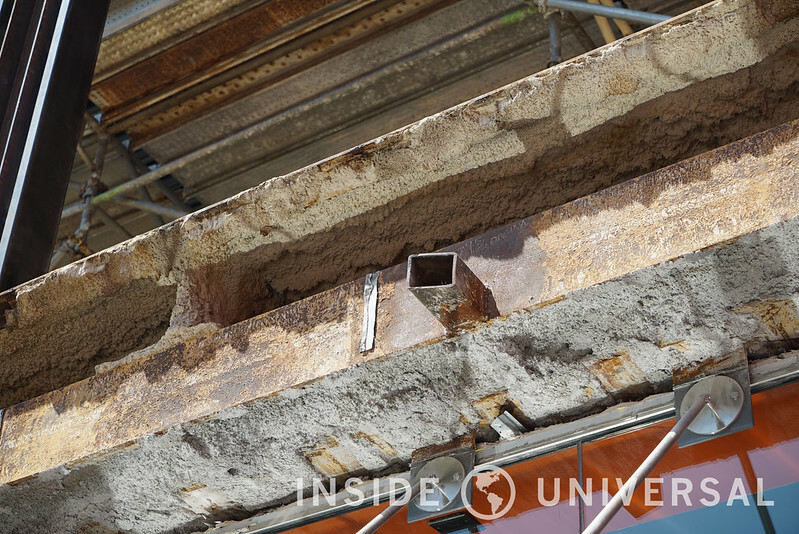 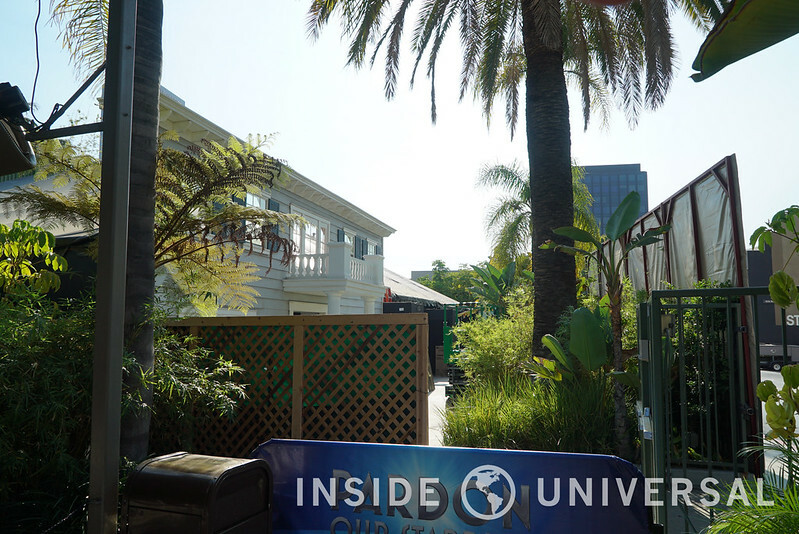 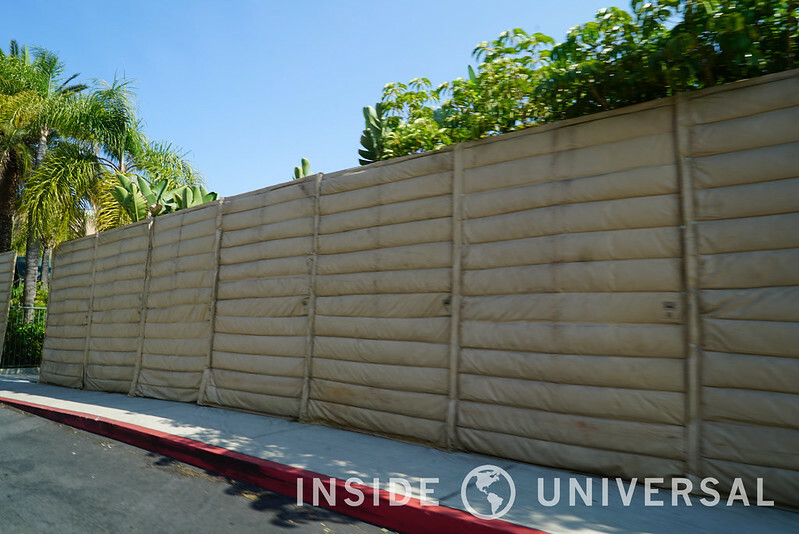 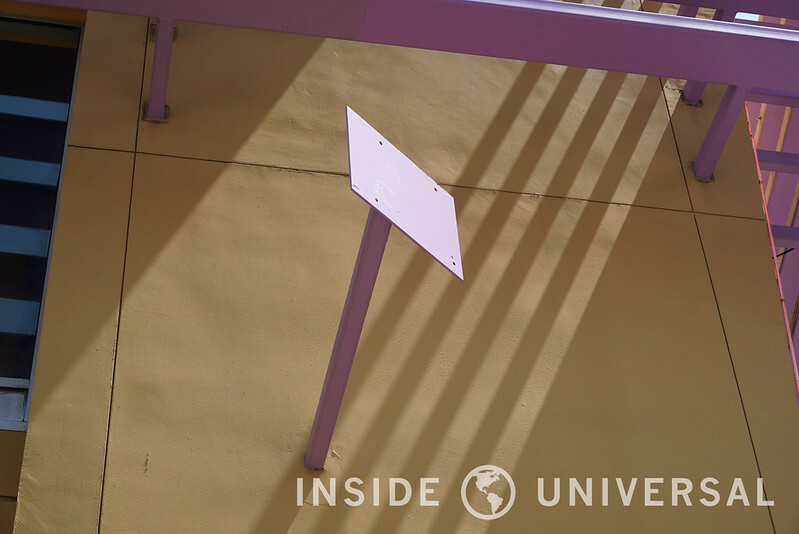 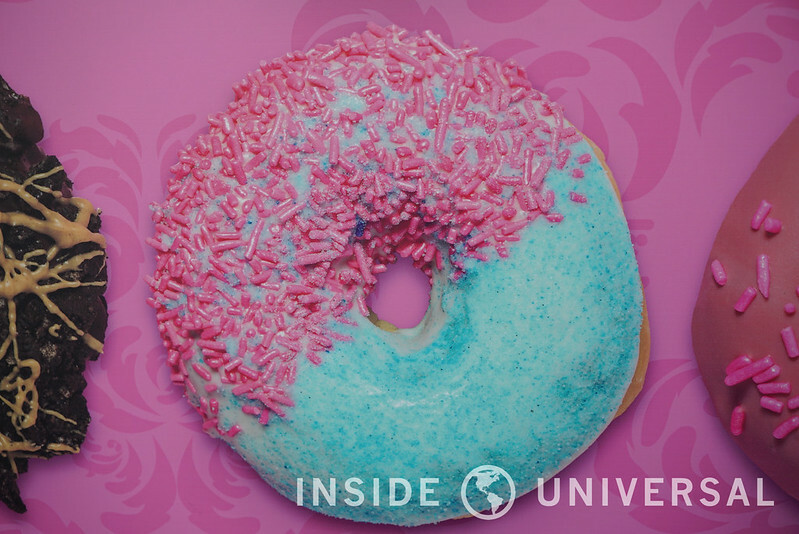 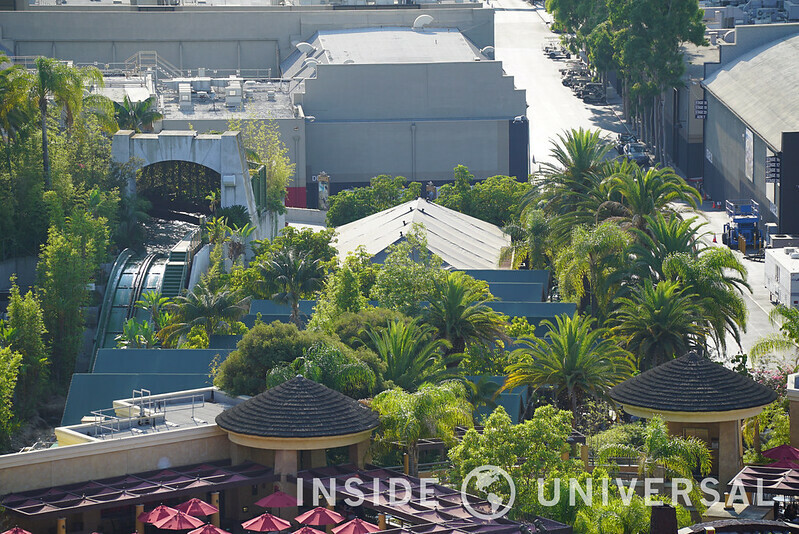 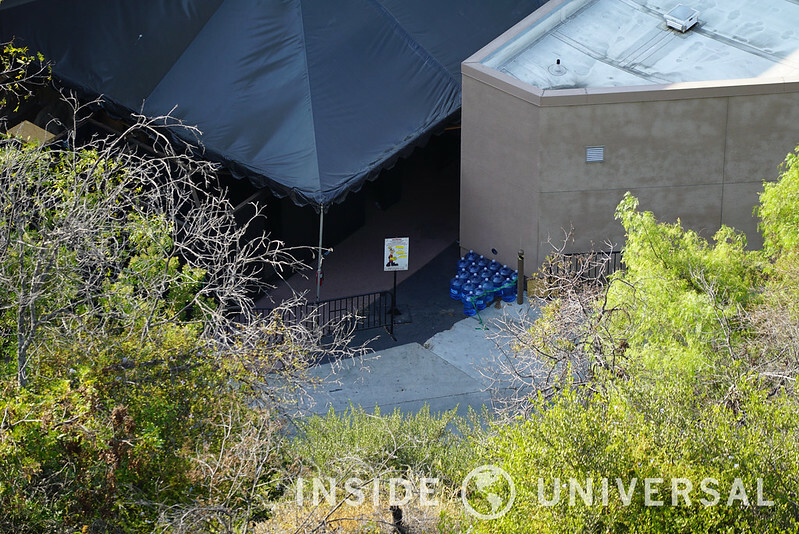 Keep following Inside Universal for the latest news! 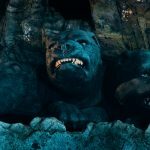 Be sure to follow us on Twitter, Facebook and Instagram and be sure to participate in the discussions over at USHForums.com. 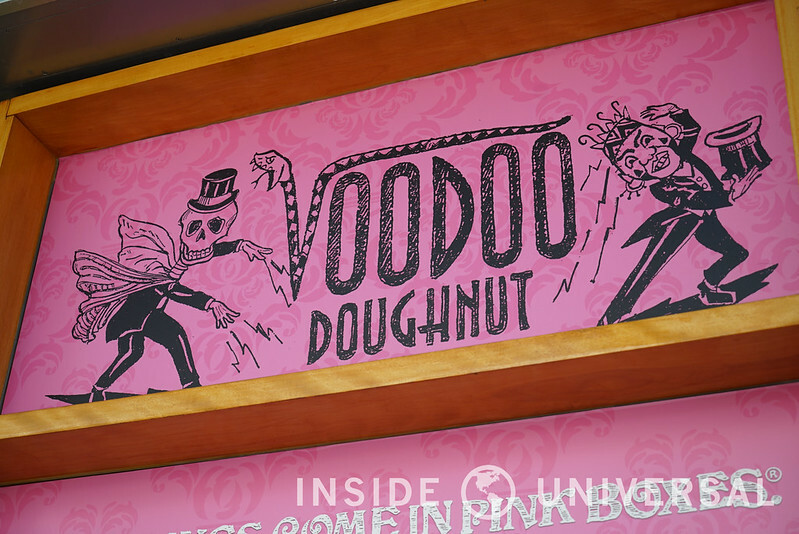 Sound off below if you have a comment, and we’ll see you in the next update.